Made In the USA. A variety of toys for small to medium birds. Let the shredding begin! A vertical sandwich full of fun! 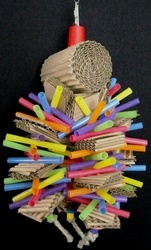 Cardboard, vine balls, beads and foam make this toy a load of fun! Stuff it with treats and make it a foraging toy! Great for small birds, from parrotlets, cockatiels, lovebirds, caiques, conures, ringnecks and similarly sized birds. This toy is great for birds who love to shred! Lots or rolls of foam, separated with foam rounds and beads! Stuff some treats inside the rolls and make it a foraging toy! How cute is this? Frilly foam paper and finger traps create a rainbow for this little plastic bear to sit atop! Great for small to less destructive medium birds, from caiques, conures, ringnecks and similarly sized birds, to less destructive medium birds, such as timnehs, greys, eclectus, goffins, etc. Chock full of beads, this millet holder is made from Stainless Steel wire and measures 12" long (untwisted). Squares of multi-colored foam are folded and stacked over and over. An adorable frog sits atop. Hide treats inside the folds to make this a foraging toy. Please note that the toy topper is random and may not match the frog in the picture.